Within this glorious Asian subcontinent, a cradle lies within a cradle of the world’s civilisation and culture. This internal cradle is the city of Hyderabad, the capital of present Telangana State and erstwhile capital of the Deccan Kingdom. Hyderabad State of the last Quli Qutb Shahi Nizam, Mir Osman Ali Khan, was well known for its culture, referred to as tehzeeb in Farsi (Persian). Farsi was prevalent in the Deccan Kingdom and many learned people in this glorious city were conversant in this language. This tehzeeb was the product of a cultural lifestyle that came down from 1591 AD by the Qutb Shahi dynasty. The Asaf Jahi dynasty is also partly responsible for making it thrive and flourish in this part of India. To be more specific, Hyderabad was popularly and historically known for its Ganga-Jamuni tehzeeb. This refers to the co-existence of unity between the Hindu and Muslim communities and their culture and traditions. Hyderabad became a model for the entire nation, and Lucknow in Uttar Pradesh followed suit later for upholding communal harmony between various castes and creeds. There was no reported instance of communal violence taking place in this fascinating city for many hundreds of years till after India gained independence and after the Police Action of 1948. Hyderabadi tehzeeb influenced many neighbouring regions and it spread its wings to places such as Gulbarga, Latur, Bidar, Bijapur, and Aurangabad. All these regions were directly under the cultural Dakhani (Deccan) influence as a result of the administration of the erstwhile Hyderabad State. Tehzeeb did not include mere social traditions and manners but it encompassed dress and garb, too. Men mostly wore sherwanis over their kurtas and pyjamas when they moved out or they were dressed elegantly in suits. Casual clothing was unheard of when people had to leave their homes and go out for any work. For women, salwar, khameez and khada dupatta were the order of the day. Hijab and burqa was commonly worn by Muslim women when they went out in public and it is still the practice among many Muslim families, today. Urdu is a language derived from the Moghal lashkars or battalions. It is a product of Farsi language blended with Hindustani, Marathi, and Telugu languages and written in Arabic font. Urdu has helped bring about an amalgamation of both the northern and the southern Indian culture, right here in Hyderabad and given in a distinct flavour. Typical `Dakhani’ Urdu or Hyderabadi Urdu is spoken with a dialect that is unique to people residing in this exciting city. Hyderabadis have helped develop a distinctive culture with a right mix of both Hindu and Muslim traditions. People all over the country have fallen in love with the typical Hyderabadi Urdu dialect. Some say that the language is so unique with one-of-its-kind words that you will not come across such an interesting language anywhere in the world other than in Hyderabad. Its appealing nuances have given this city an amiable tag as far as character is concerned. 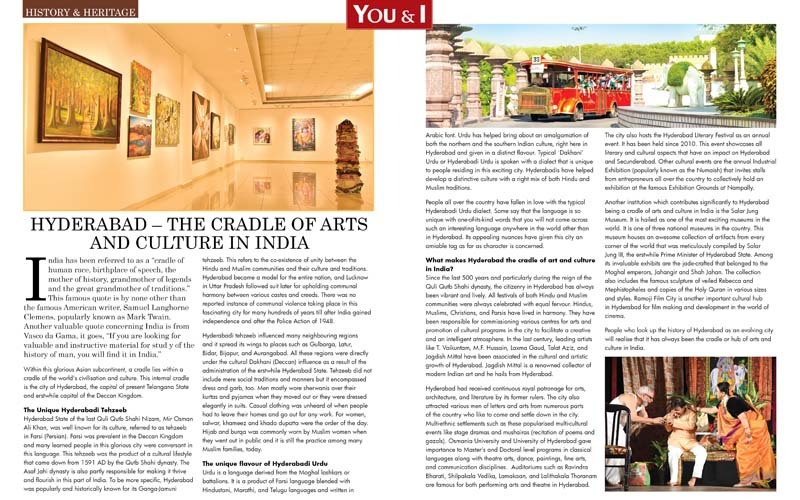 What makes Hyderabad the cradle of art and culture in India? Since the last 500 years and particularly during the reign of the Quli Qutb Shahi dynasty, the citizenry in Hyderabad has always been vibrant and lively. All festivals of both Hindu and Muslim communities were always celebrated with equal fervour. Hindus, Muslims, Christians, and Parsis have lived in harmony. They have been responsible for commissioning various centres for arts and promotion of cultural programs in the city to facilitate a creative and an intelligent atmosphere. In the last century, leading artists like T. Vaikuntam, M.F. Hussain, Laxma Gaud, Talat Aziz, and Jagdish Mittal have been associated in the cultural and artistic growth of Hyderabad. Jagdish Mittal is a renowned collector of modern Indian art and he hails from Hyderabad. Hyderabad had received continuous royal patronage for arts, architecture, and literature by its former rulers. The city also attracted various men of letters and arts from numerous parts of the country who like to come and settle down in the city. Multi-ethnic settlements such as these popularised multi-cultural events like stage dramas and mushairas (recitation of poems and gazals). Osmania University and University of Hyderabad gave importance to Master’s and Doctoral level programs in classical languages along with theatre arts, dance, paintings, fine arts, and communication disciplines. Auditoriums such as Ravindra Bharati, Shilpakala Vedika, Lamakaan, and Lalithakala Thoranam are famous for both performing arts and theatre in Hyderabad. The city also hosts the Hyderabad Literary Festival as an annual event. It has been held since 2010. This event showcases all literary and cultural aspects that have an impact on Hyderabad and Secunderabad. Other cultural events are the annual Industrial Exhibition (popularly known as the Numaish) that invites stalls from entrepreneurs all over the country to collectively hold an exhibition at the famous Exhibition Grounds at Nampally. Another institution which contributes significantly to Hyderabad being a cradle of arts and culture in India is the Salar Jung Museum. It is hailed as one of the most exciting museums in the world. It is one of three national museums in the country. This museum houses an awesome collection of artifacts from every corner of the world that was meticulously compiled by Salar Jung III, the erstwhile Prime Minister of Hyderabad State. Among its invaluable exhibits are the jade-crafted that belonged to the Moghal emperors, Jahangir and Shah Jahan. The collection also includes the famous sculpture of veiled Rebecca and Mephistopheles and copies of the Holy Quran in various sizes and styles. Ramoji Film City is another important cultural hub in Hyderabad for film making and development in the world of cinema. People who look up the history of Hyderabad as an evolving city will realise that it has always been the cradle or hub of arts and culture in India.